I went over to Montrose this evening to check the beach for large shorebirds. No Whimbrel or Hudsonian Godwits but there were 3 juvenile Willets inside the protected area. There were also a few shorebirds in the fluddle just to the west of the protected area, including a bunch of Semipalmated Sandpipers, a few Least Sandpipers, a lone Pectoral Sandpiper and a couple or 3 Semipalmated Plovers. This entry was posted in Summer Bird Reports and tagged Shorebirds, Willet on August 30, 2014 by rhughes. I rode my bike over to Montrose early this afternoon to watch the Air and Water Show, but before the Blue Angels started flying I checked the beach and had a Willet and a Baird’s Sandpiper, both juveniles, inside the protected area. I also had a “flock” of 5 Blue-gray Gnatcatchers at the southeast corner of the point. 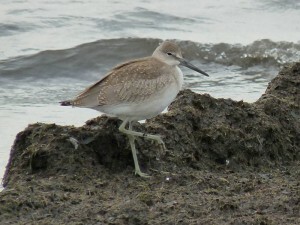 This entry was posted in Summer Bird Reports and tagged Baird's Sandpiper, Shorebirds, Willet on August 16, 2014 by rhughes. 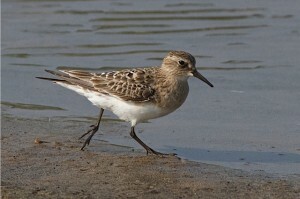 An adult Baird’s Sandpiper was inside the protected area at the east end of Montrose Beach this morning, August 1. The bird was seen yesterday too. Adult Baird’s Sandpipers are fairly unusual at Montrose; most of the Baird’s we see are juveniles. Also seen inside the protected area this a.m. were one each of Ruddy Turnstone, Semipalmated Plover, and Semipalmated and Least Sandpipers. This entry was posted in Summer Bird Reports and tagged Baird's Sandpiper, Ruddy Turnstone, Shorebirds on August 1, 2014 by rhughes.